Reset Windows Password is a bootable CD that enables you to reset local administrator and user passwords on Windows XP/Vista/2008/2003/2000/7. Instantly gain access to your system if you have forgotten administrator password or user account has been locked out or disabled. Reset Windows Password is designed to help general users to clear Windows logon password. No need to reinstall Windows! Allow you to reset Windows password instantly. ...... Reset Windows Password program automatically detects all Windows installations and user accounts on your computer. Select a user account and click "Reset" button to reset the password to blank, then you can log into your computer with a blank password. * Simple and intuitive graphic interface. * Recover or reset Windows administrator and user passwords. * Unlock and enable user and administrative accounts. * Allow you to reset Windows password instantly. * Automatically detect all operating systems installed on your computer. * Support Windows 7, Windows XP, 2003, 2000, NT, Windows XP Professional x64 Edition (64-bit), Windows Server 2003 x64 Edition (64-bit), Windows VISTA, Windows VISTA (64-bit), Windows Server 2008. * Reset Windows Password supports RAID/SCSI/SATA drives, and FAT16, FAT32, NTFS, NTFS5 file systems. 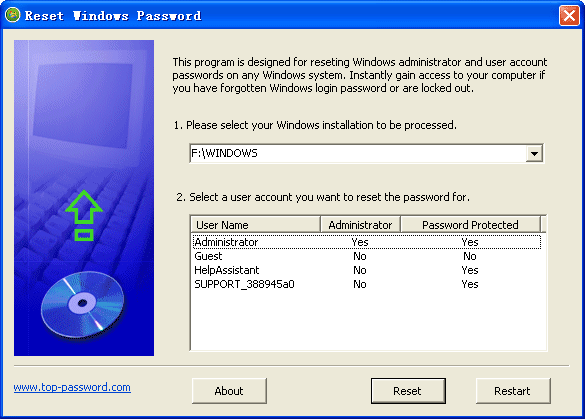 Windows Password Reset is considered as the best tool to reset Windows password. 100% Reset All and Any Windows Password on any computers guarantee! Retrieve Windows password hashes in Windows Security Accounts Manager. Windows Password Kille is considered as the best tool to reset Windows password. Qweas is providing links to Reset Windows Password 4.0 as a courtesy, and makes no representations regarding Reset Windows Password or any other applications or any information related thereto. Any questions, complaints or claims regarding this application Reset Windows Password 4.0 must be directed to the appropriate software vendor. You may click the publisher link of Reset Windows Password on the top of this page to get more details about the vendor.